Showing results for tags 'yao'. 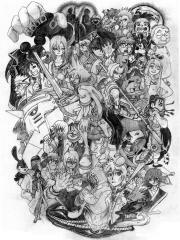 This was my recent drawing with Kingdom Hearts and Fullmetal Alchemist characters, and just for fun, I added Oswald the Lucky Rabbit. Characters: Kingdom Hearts ~ Sora, Riku, Kairi, Namine, Terra, Roxas/Ventus, Xion, Aqua, Axel, Hayner, Pence, Olette, DiZ/Ansem, Vanitas, Crimson (Original Character), Unknown (Hooded Man), Heartless/Golem, Nobody, and Unversed. 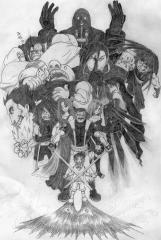 Fullmetal Alchemist ~ Edward, Alphonse, Winry, Mustang, Hawkeye, Ling Yao, Lan Fan, Fu, Sheska, Rose, Izumi, Pinako, Scar, May Chang, Xiao-Mei, Yoki, Truth, Dante (Old Lady), Father, and Selim/Pride's Shadow. Disney ~ Mickey, Donald, Goofy, Yen Sid, and Oswald.